I wasn’t a top-notch student in school, you know. I didn’t really have any inclination or desire to go to college, I just never did. I didn’t know what I was going to do after school, so dad said, “I think we could probably get you on at Caradco.” And he pulled some strings and got me on down there. I don’t know if they really needed me that bad or not. I started out wiring screens, then after two or three months that slowed down and for the rest of my career there I was farmed out to different departments. I unloaded boxcars for a while. The raw wood would come in and we’d go across the tracks there and put it on wagons and haul it into the different cutting rooms and unload it. I know I was struggling with that. Well, these guys that were doing it, they knew how to do it, but I had a hard time. I’ll tell you, I was shot at the end of the day. Well, I was only seventeen when I started there. In fact, I remember they had a safety rule that you couldn’t go in the elevators if you were under eighteen, so I wasn’t even allowed in the elevators at first. Anyway, I floated through the plant doing different things. In the glazing department I remember this guy named Arnie Maus. He was a glazier and he had a thumb that was about three times as wide as the other one, because that thumb was the one on the putty knife. It was amazing to watch him work. He could glaze a window in about thirty seconds and it would look like a machine did it. But you do that all day long and … he had that thumb all flattened out. I would get jabbed about my dad a little bit. 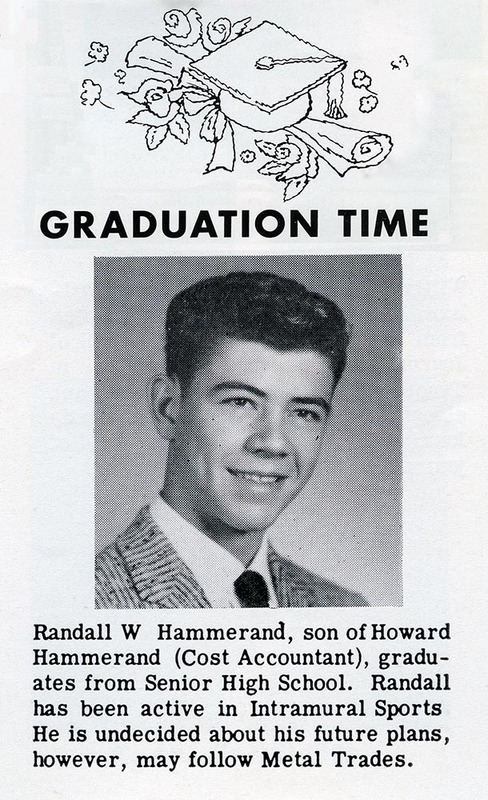 “Hammerand, are you related to Howard?” One time I was farmed out to a cutting room where I was supposed to replace a woman who was sick that day. There were six or seven guys on saws cutting different lengths of boards. They’d push them off onto this long conveyer belt and my job was to take different lengths off and put them on carts so that they were all sorted by length. Then all the small pieces you’d leave and they would fall down in a hole at the end of the conveyer belt and some guy in the basement would sort them little bitty ones. So the guys running the saws seen me coming and they sawed as fast as they could so that I couldn’t possibly keep up. Boards were getting down there to the end and piling up like jackstraws and some were falling down in the hole. The foremen came in and said, “I got a woman who does this job! What’s the matter with you? Can’t you get this done?” I said, “Well you better be gettin’ her back.” I was really teed off. And the saw operators were just laughing. Those guys really run me through the ringer. I think it was only about a couple of weeks later where things slowed down more and they laid me off. I worked at Ridge Motor and Machine for a couple of years after that, then I got on at John Deere and I worked out there for thirty-three years. 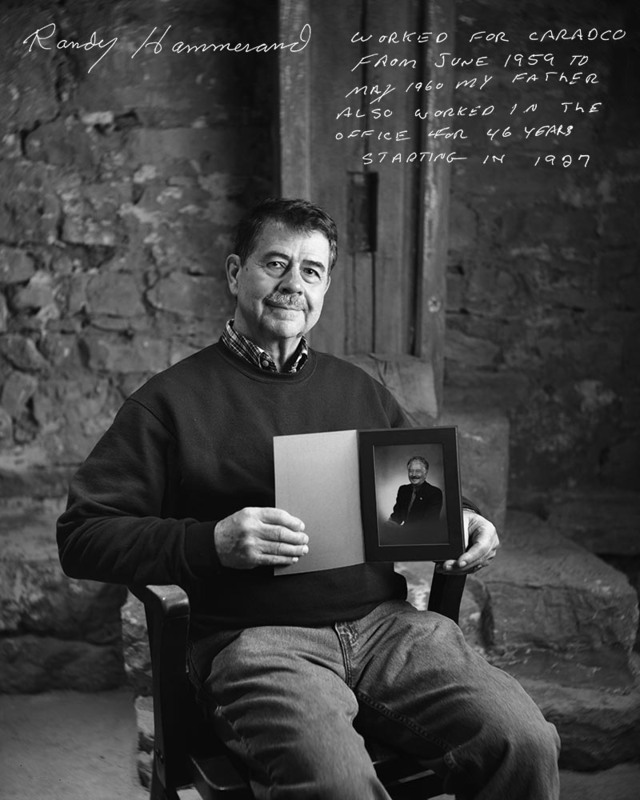 My dad, Howard, worked at Caradco about forty-five years. He started in 1927 as an office boy—he started right out of high school. I think he did different jobs in the office—time standards, that was one—and then he ended up being a cost accountant. Figuring out the cost of materials to make a profit, you know. I think my dad liked his job at Caradco, but he never made much money there. If I remember right, I don’t think he made more than seven or eight thousand dollars a year. That was his top—at the end. And when he retired in ’74 his pension was minimal. But we got by. My mom didn’t work, we never lived in a fancy house—we lived down on Providence Street by Sacred Heart. It’s a bad place now, but in those years it was nice. We always had a halfway decent car and went on vacations. Nothing fancy, but we had a good life. But, no, my dad never ever had much money. He lived pretty much week to week. 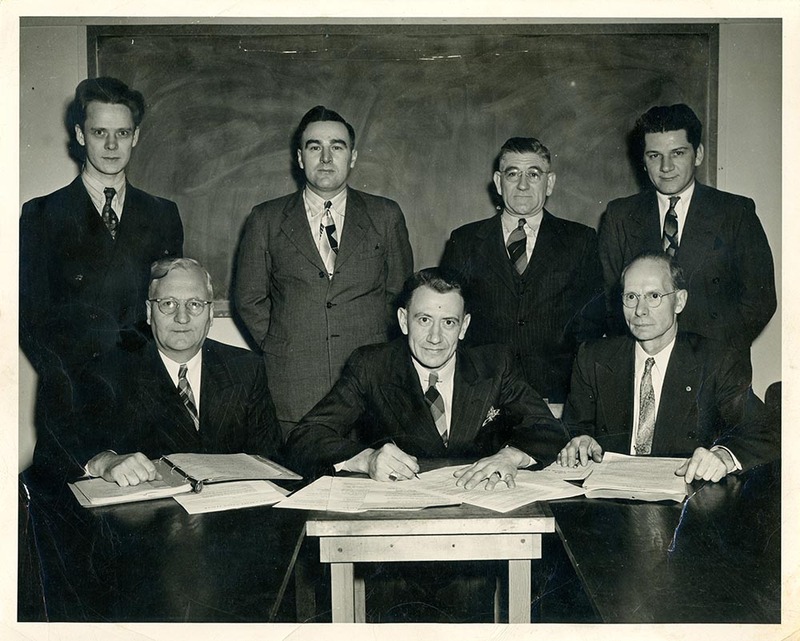 Howard Hammerand (front row, center) with other members of the Bilt-Well Credit Union board.